Trumbull players walk off the court after being defeated by East Catholic in CIAC Division I state semifinal action in New Haven, Conn., on Wednesday Mar. 13, 2019. Some boys basketball games were close, like the road trip at Bassick. Most were blowouts en route to Wednesday night’s Division I state semifinal against Trumbull. 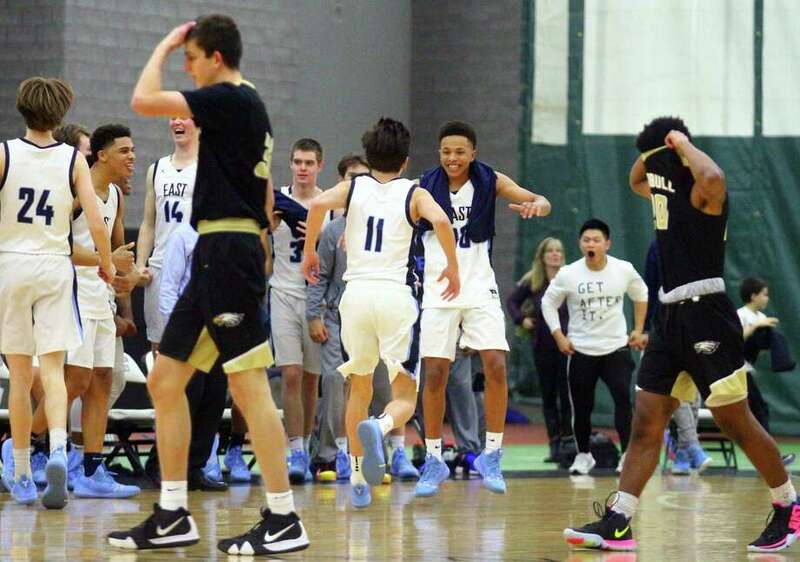 Trumbull was dealt the same fate as most of East Catholic’s opponents, falling 86-58 at the Floyd Little Athletic Center. Top seed East Catholic (26-1) has also beaten Windsor — its opponent in Saturday’s state final — this season and three times last season. But the Warriors are the only team to beat East Catholic in each of the last two years. Both of the losses were in the postseason: last year in the Division I quarterfinals at the buzzer in double overtime and two weeks ago in the Central Connecticut Conference tournament final. The two CCC bitter rivals meet for round three Saturday night at the Mohegan Sun Arena. Game time is 8:15 p.m.
Trumbull (20-5) had the early lead against East Catholic, which then went on a 14-2 run to close out the first quarter and take a 23-16 lead. Trumbull’s Timmond Williams (22 points) scored the first basket of the quarter on a 3-pointer, but East Catholic scored the next seven points. East Catholic shot 8 of 10 from the floor in the second quarter, repeatedly beating Trumbull off the dribble to the basket. Joey Reilly, Luke’s nephew, and Hunter scored all but 10 of East Catholic’s 41 first-half points. Both players led the winners with 24 points apiece. ‘Great win for our guys, great win for the program,” Luke Reilly said. Trumbull, which had eliminated Sacred Heart in Monday’s quarterfinals, never got within single digits in the second half. Chris Brown added 12 points in his final game for Trumbull. This was Trumbull’s first trip to the state semifinals since 1974, the last time the program also advanced to a state championship final. Jaylin Hunter, East Catholic. Senior guard Jaylin Hunter scored 24 points, ran the offense and made several key defensive plays. EDITOR’S NOTE: Trumbull did not win the state championship in 1974. The Eagles lost to Wilbur Cross, the No. 1 team in the nation that season. Mileeq Green 2 0-0 5, Dylan Palinkas 0 2-4 2, Chris Brown 6 0-2 12, Timmond Williams 7 5-5 22, Evan Gutowski 2 0-0 4, Quentar Taylor 7 0-0 13. Totals 24 7-11 58. Joey Reilly 9 4-6 24, Chris Jones 5 1-2 11, Frank Mozzicato 1 0-0 3, Matt Knowling 6 4-4 16, Jaylin Hunter 10 0-0 24, Matt Byam 1 1-2 3, Cooper Limric 1 0-0 2, Sam Walsh 1 1-2 3. Totals 34 11-16 86. Records: T 20-5; EC 26-1.